In Portugal, over ninety-four percent of the population is Roman Catholic. They are strong in their beliefs and believe sincerely in their Saints. There is a famous legend in Portugal about an apparition of the Virgin Mary to three children. One day many years ago, three children were tending their sheep in a field. At noon, as was their custom, they knelt down in prayer with their rosaries (prayer beads). After praying, they began to play. Suddenly, they saw a flash of lightning. Thinking that a storm was coming, they began to herd their sheep downhill. Once again, they saw the flash of lightning and on the hilltop appeared a radiant lady of beauty. This legend is known as "Our Lady of Fatima" and a huge monument was erected where she was believed to have appeared to the three children. Every year thousands of people come to Portugal on pilgrimages to this historic site. 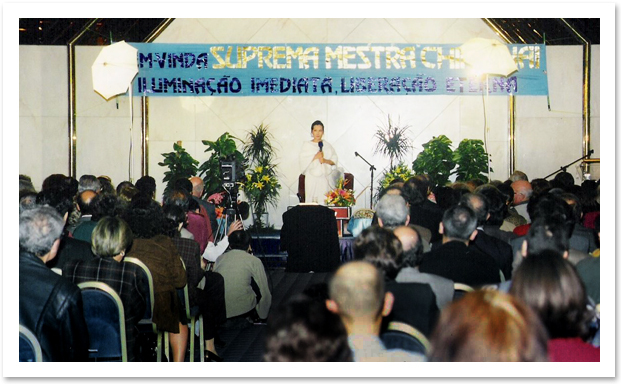 On 7 May 1999, another beautiful lady of Light appeared before a large crowd in Lisbon, Portugal. 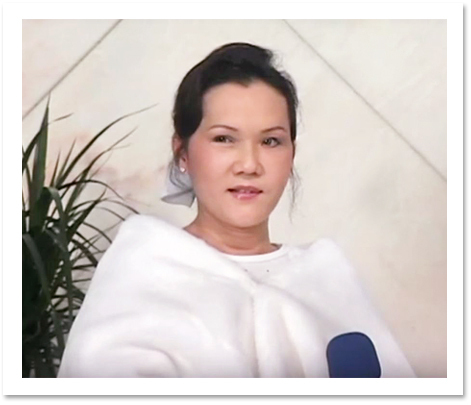 The Supreme Master Ching Hai lectured to a packed audience of Portuguese people at the luxurious Meridian Park Hotel in the center of downtown Lisbon. Prior to the Portugal lecture, many of Her disciples from different countries had come to prepare for Her arrival. They found that the people they met in Lisbon were open-minded and warmhearted and showed great interest in Master's sample booklets and leaflets. When fellow initiates from Brazil distributed leaflets in the chilly wind and rain, a passerby came up to talk with them and asked many questions. He then offered to lead them to a "University City" to distribute leaflets. On the way he showed them subway stations and other crowded places. When Korean fellow initiates went downtown to put up posters, they could not find parking, but unexpectedly a policeman offered to help. Searching for ten minutes, he finally found a parking space and guided our fellow initiates there. The lecture was held in a nice hotel. We were allowed to enter the lecture hall four hours before the scheduled starting time. Everyone moved around swiftly, soon transforming the hall into a sacred place. The members of the Celestial Clothes and Jewelry Groups made an astoundingly beautiful arrangement of Master's artworks, literally creating a Heaven on Earth. When everything was in order, the lecture hall had become tightly packed. A short film was first shown giving a brief account of Master's life. After the audience watched the film absorbedly, several fellow initiates talked about the benefits of a vegetarian diet and how the Quan Yin Method improved their quality of life and state of mind. Then our beautiful Master, in a white gown and a white cape, arrived at the venue. Many youths and ladies kept their eyes on Master, smiling. A Portuguese lady hurried away, telling us that she was going to bring her roommate there to see Master. A young man also went off to fetch his girlfriend so that they could together witness the most significant event in their lives. The wholehearted sincerity of the Portuguese when they embraced Master's teachings struck us with awe. Though they are not rich, they eagerly purchased Master's books for further study. Many of them requested to learn the Convenient Method or the Quan Yin Method of meditation. A twenty year old Portuguese man left his home and had no money in his pockets. As he walked on the street, he saw our poster and was suddenly awakened. He very much wanted to attend the lecture. While thinking about this, he got just enough money to cover the bus fare to the lecture hall. While listening to Master's lecture, he had a feeling that he had known Master's teachings for a long time. During the time for questions and answers, Master's answers came to his mind even before She spoke. In this unsophisticated country, it proved true that material wealth does not stand for richness of spirituality and morality.